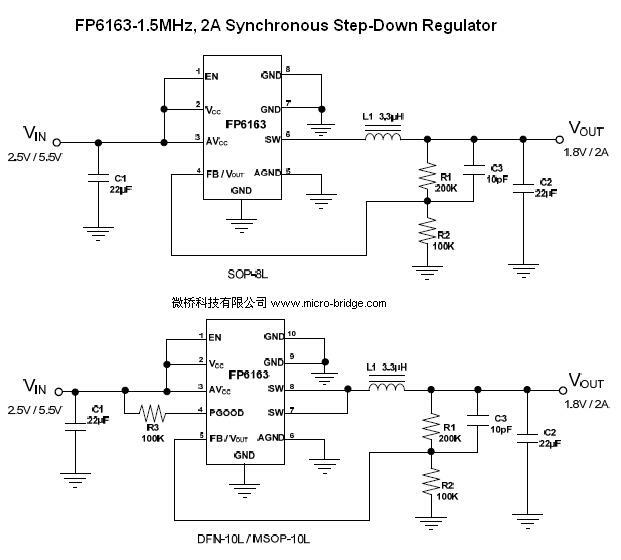 �@The FP6163 is a high efficiency current mode synchronous buck PWM DC-DC regulator. The internal generated 0.6V precision feedback reference voltage is designed for low output voltage. Low RDS(ON) synchronous switch dramatically reduces conduction loss. To extend battery life for portable application, 100% duty cycle is supported for low-dropout operation. Shutdown mode also helps saving the current consumption. The FP6163 is packaged in MSOP-10L, DFN-10L and SOP-8L to reduce PCB space.